Did you know that the best golf putters can certainly help your game by increasing performance on the green. Putting is a part of golfing, which requires a lot of attention and precision. A good or bad putter can be the difference between a par and bogey. Getting the right putter for yourself can be a task, but the finding the best putter will definitely improve your game. A wrong selection of putter can make your whole game go bad. There are numerous kinds of putters in the market and deciding among them can be an uphill task. Below are 4 best golf putters reviews that we have tried and recommend. Things to keep in mind while choosing the best putter? Featuring a contrast white finish that will help it stand out on the grass of the green, this putter promises to help maintain player’s focus when putting. The precise white finish will ensure that you are paying attention to the putter and ball, while you are putting. The stark white finish will stand out from then grass of the green, players will be putting on. The Pinemeadow putter was designed with a tour weight in mind making it easier to handle. The head of the putter weighs 380 grams and the shaft weighs 40 more grams. 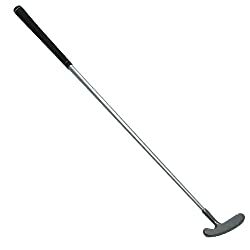 At 34 inches in length, the putter is a comfortably long putter that is easy to handle, for people who are right handed. The putter is oriented for the use of right-handers. 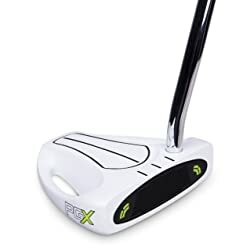 In short, the putter’s advantages are that it has a sturdy weight to the head, its stark white finish makes it stand out from the green, and the putter is also weighted nicely making it easy to use. For the downsides, its thin shaft can make it seem like the putter is somewhat shaky. And only right handed people can use this putter because its orientation is for right handed use. This putter’s main feature is the ability to use it in both a left and right handed orientation, allowing people who have different dominant hands, to use this club. 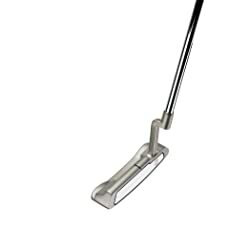 This is the ideal putter for left-handed persons who want to have golf clubs that they can use. The putter measures around 33.5 inches, measured along the shaft. Quolf Golf has created a versatile putter for those who are looking for a left and right handed golf club. Designed with performance in mind, the Odyssey White Hot Pro 2.0 is built to the exact standards of professional golf. The placement of the putter’s heel is designed specifically to balance with the shaft offset and crank neck; this will provide a more accurate experience when putting on the green. The alignment and feel of the putter is maximized thanks to this design feature. The precision design and construction of this club is made according to the exact standards of professional golfers around the world. The head of the club is a classic putter head design, with some shaft redesign to improve putter performance, based on new design technology. Overall, this is a good club that features 3 different lengths, which most people can use. And a good weight of 343 grams, making it neither too heavy nor light. 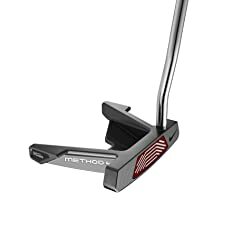 We think that people who are just starting out in the world of golf should not use this putter as the design of this Odyssey putter does not aid the game of most players who are just starting out; instead, more advanced players are the ones, who can take advantage of what this putter offers. Another mallet head putters on this list, except it is a much more advanced version. The Nike Golf Clubs Methods Core Drone 2.0 offers a lot, coming from one of the top sports manufacturing companies. Nike designed this putter to have a lower center of gravity, by adding more weight to the middle of the putter head. This creates a steadier and consistent roll when you hit the ball. This putter gives a lot of control to the ball’s distance. Players can predictably control the movement and distance of the ball by using this putter. Hitting the ball on the center of the putter, makes a satisfying sound, indicating it was hit at the right point. The large head of the putter also gives players a lot of room to hit the ball with. One negative of this putter is that Nike designed this golf club to be a little way out there. The futuristic design looks more like a cyborg rather than a golf club, but this is a personal preference, and some players may like the look of this putter. There are numerous factors to consider when picking out a putter. Because it is such an essential golf club, players need closely look at their putting and golfing habits. Here are a few things to consider when you are buying a putter. The taller you are, the longer the putter you should use, the same goes for people who are shorter. A putter that is too short can make you hunch, potentially making your swings to hard and inaccurate. A well-weighted putter will not feel too light because that can make a golf club feel cheap. While a too heavy golf club will make you swing too hard to compensate for the weight. There are multiple kinds of putter types. A brief rundown of them would be Mallet, Heel and Toe Weighted, Blade, and Centre-shafted. Depending on your preferences, the best type to choose will vary. These are the few things to consider when choosing the best putter in golf . Your height, dominant hand, and other preferences will determine the kind of putter that will be best suited for you. Check out the putters that we recommend to begin your search for the best putter in the market. Uniquegolfgears.com is a participant in the Amazon Services LLC Associates Program, an affiliate advertising program designed to provide a means for sites to earn advertising fees by advertising and linking to Amazon.com.